Wool pile: 470 knots/square inch, asymmetrical open to the left, 13 colours. The beautiful carpet was woven in Iran, probably in the first half of the sixteenth century, during the reign of the Safavid dynasty. While it does not have any inscriptions linking it with a specific patron, place or date, the design holds many parallels with the arts of the book in early Safavid Iran, and with similar hunting carpets. Despite its large scale, this medallion carpet has a fine and complex design that rewards very close inspection. In its general layout, there are two lobed black medallions down the central axis, with four diagonal radiating oval pendants each, all set against a dark red main field. These medallions are then repeated by quarter-medallions in the four corners of the field, and by two half-medallions on either side. Each medallion is filled with a very refined radial design of yellow strapwork and large flowers, while each oval pendant is occupied by fluttering birds and Chinese-style cloudbands. Below this medallion superstructure, the red main field is a rich and varied garden landscape of trees and wildlife. There are trees with white blossoms, and others filled with ripe pomegranates. There are also leafy spiralling stems, with large lotus flowers. Among this greenery, the carpet is filled with animals and birds: there are resting pairs of spotted goats, lions and treetop birds. Predominantly though, the main field is full of hunting scenes: leopards killing horned goats, hawks killing long-legged water birds and lions killing stags. Down the central axis of the design, there are ornate Chinese style vases, formed of dragons, lions and peacocks, and lobed ponds full of fish. Beyond the main field, the main border features a reciprocal pattern, of an interlocking arcade in red versus black (or rather extremely dark blue indigo). On a slightly more condensed scale to the main field, this border also features hunting pairs: a snow leopard attacking a horned goat, and a lion pinning down a bull. A beautifully drawn pair of supernatural creatures confront each other in the dark blue arcading: a Chinese-style dragon opposite a long-tailed phoenix. Throughout the main and two minor borders, the design also features overlaid designs of leafy plant scrolls and Chinese cloudband motifs. 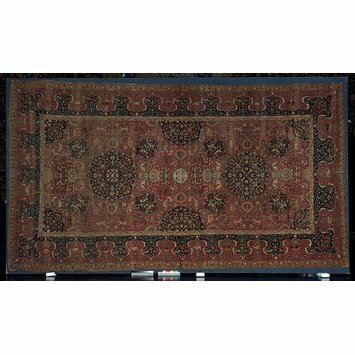 Carpet, wool knotted pile on silk warp and weft, repeat medallion design on red ground filled with animals, birds and trees, main border with reciprocal design. The Chelsea Carpet is so called because the Museum purchased it from a dealer in Chelsea (in southwest London), named Alfred Cohen, in 1890. Aside from this, the carpet's provenance is not known, but its quality of design and production strongly suggests a court-level workshop in early sixteenth-century Iran. Wilhelm von Bode and Ernst Kuhnel, tr. Charles Grant Ellis, Antique Rugs from the Near East (London: G.Bell, 1970) pp. 124-127. THE CHELSEA CARPET was given its name simply because it was purchased from a dealer in the Kings Road, Chelsea. It is a 16th century Persian carpet and may have been woven in Tabriz, in the north-west of that country. It is one of the most beautiful and most important Persian carpets to have survived from that period.